The task at hand was to install a divider panel in a lavish public rest room. The panel was to attach to the back wall as well as at the ceiling and floor with decorative chrome stand-offs. 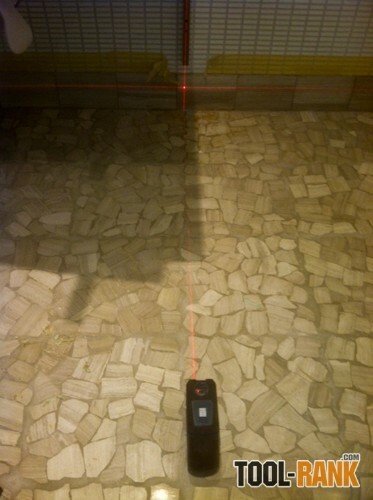 These stand-offs, points of contact with the floor and ceiling, are what made good use of the laser's self leveling beam points. 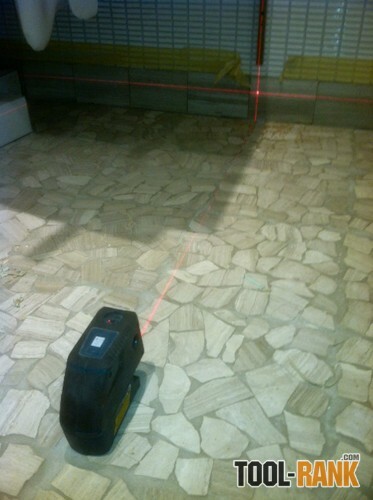 Setting the laser the correct distance from the wall, it gave me a ceiling mark and a plumb mark at the floor for drilling. Using the left-right beams, I was able to square the location of the panel with the back wall. Simply done, I put a mark on the wall to the right of the tool, and a mark on the left at the same distance. Once the left-right beams were positioned to hit my marks, I was square; and with the cross-hair lines showing the red laser on the wall and ceiling, the panel location was perfectly established. Without the use of a 6-foot bubble vial level I had a line for my wall cleat. Without the use of a large framing square, a chalk line and a third hand, I had a placement line on the ceiling. And with the bonus of having a continuous and visible level line I could even ensure that the panel was level with the floor, or more accurately, level despite the floor. 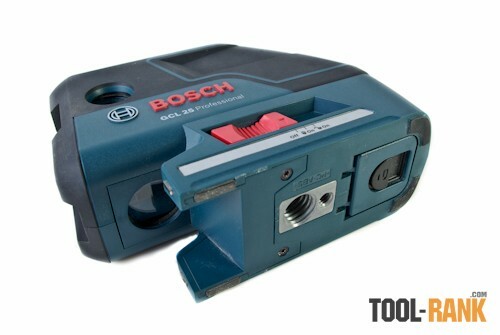 I believe the use of this tool for layout purposes saved me time and ensured accurate placement of all the components. 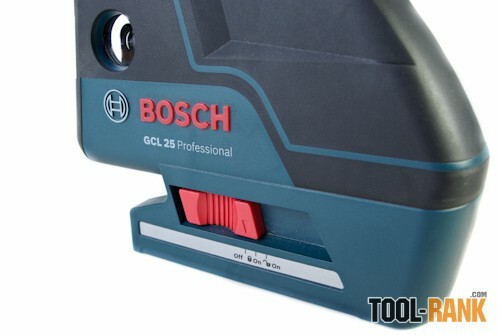 I found it easy to use and it saved me having to use a helper along with the other tools mentioned. Comparing the laser light itself, it is not as bright as the Pacific Laser Systems layout tools I've used, but PLS doesn't have this tool combination. 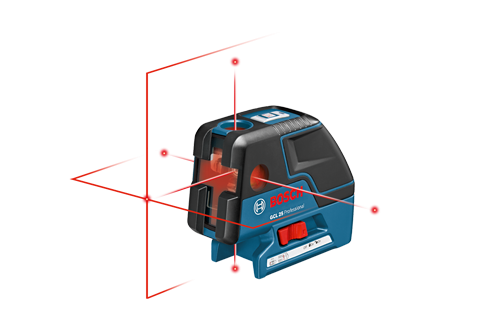 The power switch on the GCL-25 can be locked on, allowing a continuous horizontal line for a grade out of level, or a vertical line out of plumb. 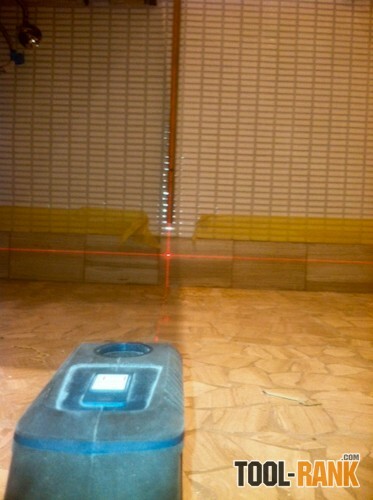 Simply put, this disables the tool's self-leveling feature; you can not, however, use the beam points in this manner. 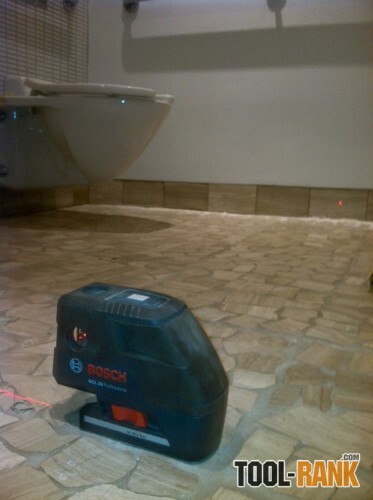 With power on in unlock mode (self leveling) all features are on—horizontal, vertical, and five point beams. The button on top allows you to use these independent of each other. The base of the tool has screw mounts that accept both types of tripods, which is a nice touch; it's a small thing, but it is one less thing to worry about when trying to attach to an existing tripod or accessory laser mount. 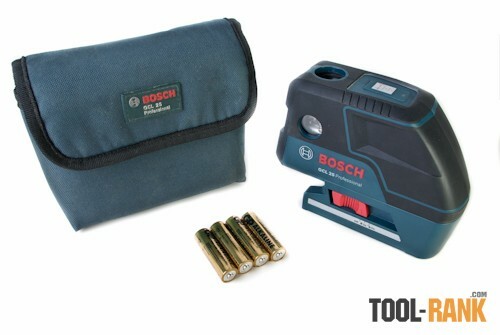 Included with the laser are the required AA batteries, as well as a soft carrying pouch. 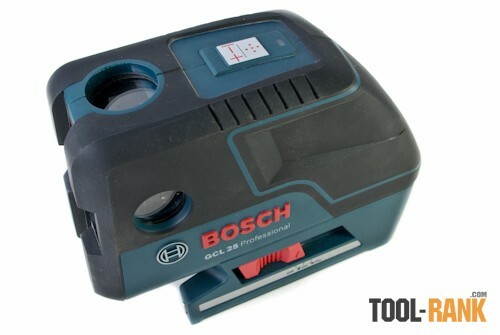 Previous Bosch line lasers included a hard case, but this model did not. 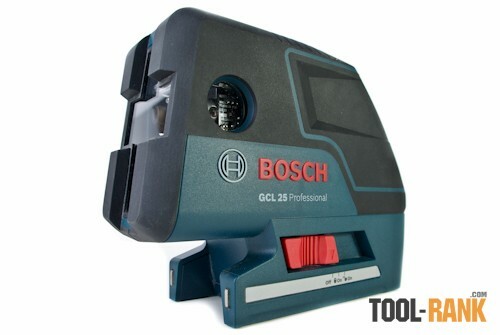 The GCL-25 really does do the job of two lasers, and even at around $280, it is less than buying both a 5-point and a line-laser separately.